Step 2: Peel them, please peel them – I have seen people put whole bananas with the skins in the freezer. This is gross and a time waster. When and if you do finally pull them out of the freezer they will be mush and the peels will have turned purple black and you will be trying to pull off a tough peel while banana goo is oozing everywhere. Peel them. NOOOOOOOOOOOOOOOOOOOOOOOOOOOOO. I only JUST put bananas in the freezer TWO days ago and just now seeing this blog post. ARGH. 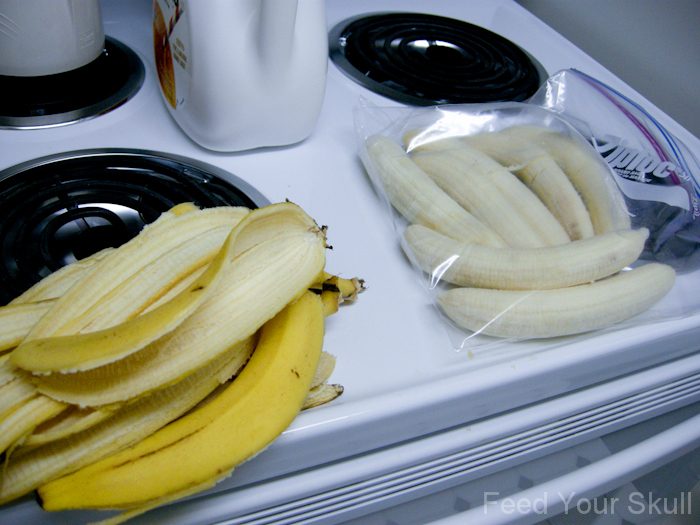 As I’m sure you have surmised….I.did.not.PEEL.the.freakin.bananas. I even Googled it too. And they have this putrid ‘color’ of sorts. That is all as I hang my head in shame.